My new go-to holiday no-milk shake, this festive Cranberry Smoothie recipe has no added sugar and packs a real superfood punch. It’s great for a light breakfast or a pre or post workout refresher, but it also makes the perfect pre-party holiday snack. When people ask if I have any tips for eating clean throughout the holiday season, I always say the most important thing is to never head to a party starving. It is next to impossible to pass up those indulgent passed party hors d’oeuvres or decadent desserts if your stomach is grumbling. 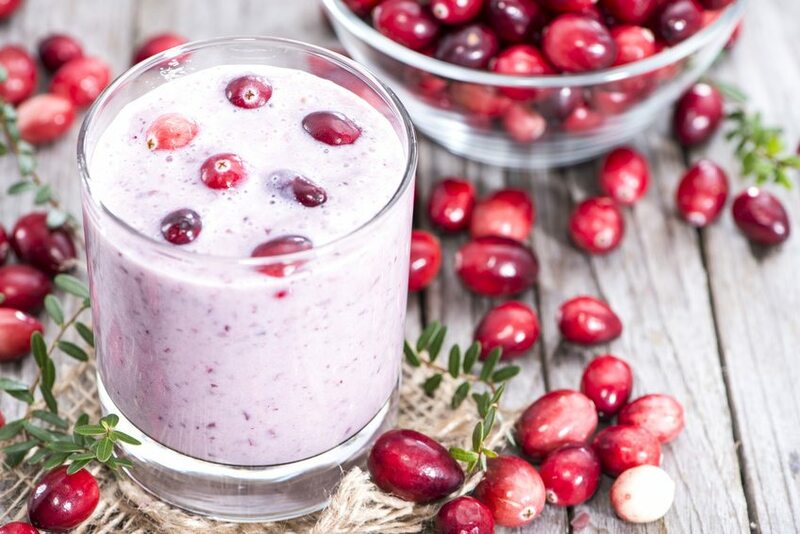 The Superfood Cranberry Smoothie will definitely take the edge off your hunger but it won’t leave you feeling too full or heavy. Packed with an astonishing array of phytonutrients, anti-oxidants and anti-inflammatory compounds, it’s also the perfect way to fill in much-needed nutrient gaps during this hectic time of year. Although the Cranberry Smoothie is already plenty rich in nutrients as-is, you might want to consider adding in a specialty superfood in the form of freeze-dried Goji powder. Freeze-dried goji powder offers all of the benefits of the whole berry in an easy-to-use and more digestible form. With the addition of just one tablespoon of goji powder per serving, you will instantly, dramatically and effortlessly boost the overall nutritional content of the Cranberry Smoothie. One of the richese sources of antioxidants on the planet, Goji berries (and goji powder) are a powerhouse of nutrition and a great source of vitamin A, vitamin C, more than 20 trace minerals and vitamins such as zinc and iron as well as anti-inflammatory phytonutrients. 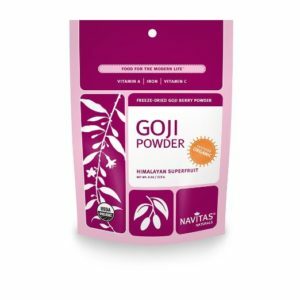 Goji powder is also highly versatile and can easily be added to other smoothies, mixed into chia puddings, sprinkled on oatmeal or cereal, stirred into green drinks, hot teas and more. My favorite brand is Navitas Naturals (see photo above). 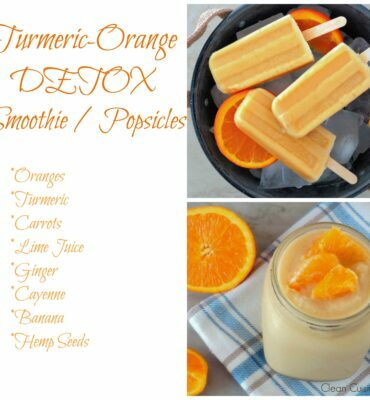 It can be purchased at places like Whole Foods or online for a discount at Amazon. 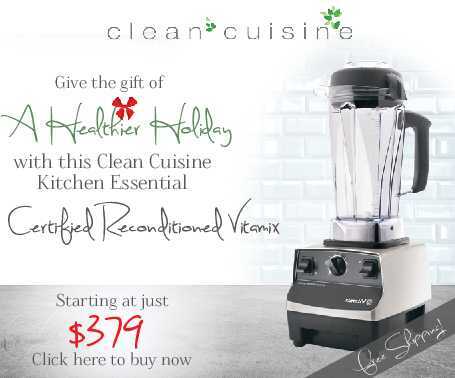 Add the ingredients in the order listed above to a high-speed blender (such as a Vitamix) and process on high speed for about 1 minute, or until all ingredients are well blended. Drink chilled. Place the coconut can in the refrigerator for 5 hours or the freezer for 1 hour. Remove the chilled can and then flip the can upside down. The liquid coconut milk (the part that doesn’t harden) will now be at the top of the can; pour the liquid off and save for another use. 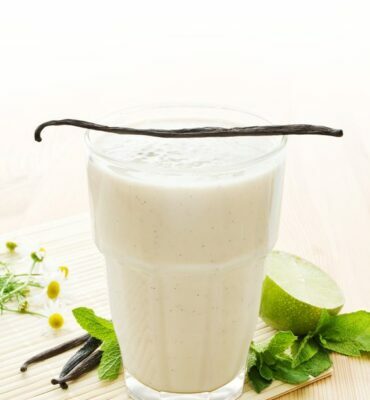 Spoon out the hardened coconut cream and measure 1/4 cup for the smoothie recipe. P.S. If you love the Cranberry Smoothie recipe be sure to check out the Cranberry Kale Cooler recipe by my friends Jadah and Jen over at Simple Green Smoothies! And if you are thirsting for a more spirited cranberry sipper, try my Cranberry-Pomegranate Cocktail.